A diamond necklace makes the perfect gift for young and old. For years people have been giving diamond necklaces to those closest to them. Diamond necklaces are available in many different shapes and styles. Whatever you are looking for in a gift, most likely you will find it in the form of a diamond necklace. Diamond necklaces make great gifts for graduations and special birthdays. Most girls would love to get a diamond necklace on their 16th birthday. There is no need to spend thousands of dollars on a diamond necklace for your daughter. You will be able to find plenty of diamond necklaces in any price range. If you are going to a fancy party, you may want to consider purchasing a gorgeous diamond necklace to compliment your gown. A diamond necklace compliments any type of dress or gown. No matter what color you are wearing, these fabulous necklaces will bring out all of the best features. Diamond necklaces are available in different metals. The most common being white gold, yellow gold and platinum. If you can find a sterling silver diamond necklace, you can save yourself a lot of money. The problem with these necklaces is that they are less common. Many people want the diamond look without the diamond effect on their bank accounts. A silver diamond necklace offers you this alternative. Diamond necklaces can also come in a variety of themes. Heart-shaped diamond necklaces are very popular. These are classic and they will never go out of style. They make the perfect gift for your loved one. 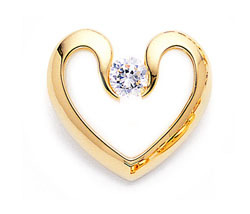 Your diamond heart necklace can have one diamond or 100 diamonds depending on your taste and budget. If you want to find a diamond for a particular hobby or interest, chances are there is a diamond necklace to reflect this. There are tennis racket diamond necklaces, bible diamond necklaces and even doggie diamond necklaces. There really is a diamond necklace out there for everyone. Diamond necklaces are the perfect gift for anyone that you love. If you are interested in making a lasting impression, a diamond necklace is a wonderful option.